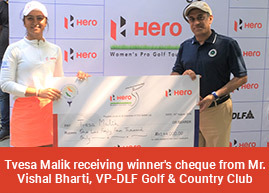 Gurgaon, March 21: Neha Tripathi finished strongly to grab the lead with a 3-under 69 in the opening round of the sixth leg of the Hero Women’s Pro Golf Tour. Playing at the Classic Golf & Country Club on Wednesday, Neha, who has been a runner-up in two of her last three starts, is one shot clear of Amandeep Drall (70), who has not featured on the domestic circuit since the first two legs. There is a three-way tie for the third place with Tvesa Malik, Gaurika Bishnoi and amateur Ridhima Dilawari carding 71 each. Yet another young amateur, Sifat Sagoo, shot even par 72 to be sole sixth. One shot behind Sifat was Trisha Sunil (73) in seventh place. Two of the pre-tournament favourites, Vani Kapoor and Gursimar Badwal went through the first round without a single birdie, carding 74 each to be tied-8th alongside Mehar Atwal. Neha opened with a bogey, but birdies on third and sixth saw her get to under par, before a bogey on Par-5 ninth brought her down to even. On the back nine, she birdied 10th and then found birdies on 14th, 16th and 18th, while dropping one shot on Par-3 17th. Amandeep also opened with a bogey, but added three birdies on third, 15th and 18th and dropped no further shots in her 70. For Gaurika, it was a tale of two halves. On the front nine, she had four birdies and no bogeys but on back nine she had three bogeys and no birdies for 71. Like Neha and Amandeep, Tvesa also dropped a shot on first, but she played steadily thereafter with two birdies and no more bogeys for her 71. Ridhima had three birdies against two bogeys. Vani and Gursimar had two bogeys each on front nine, but parred all the holes on the back stretch in their cards of 74. In the second round, Tvesa Malik, Amandeep Drall and Neha Tripathi will go out in the final group, preceded by the two amateurs Sifat Sagoo, Ridhima Dilawari and professional Gaurika Bishnoi. In the morning, Hita Prakash and Priya Puri, paired in a two-ball, go out first followed by Komal Chaudhary, Millie Saroha and Tavleen Batra. The third group sees Sonam Chugh, Ayesha Kapur and Siddhi Kapoor while the fourth has Afshan Fatima, amateur Tanirika Singh and Suchitra Ramesh. Khushi Khanijau, Smriti Mehra and Vani Kapoor constitute the fifth group followed by Gursimar Badwal, Mehar Atwal and Trisha Sunil in group six, just before the last two lead groups.